Ostrich is a red meat that has a mild beef-like flavor and shrinks very little when cooked. 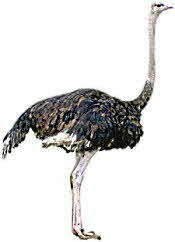 Ostrich meat is very low in fat and cholesterol. Ostrich is best when served rare to medium rare. Ostrich meat is very quick to absorb the flavor of a marinade, so don't overpower the taste of the meat. Ostrich meat contains little fat, therefore it does cook differently than beef. Tender cuts should be grilled, broiled or fired.